MADE IN SEBASTOPOL A careful viewing of 'Coco' will reveal images drawn from Michael Anthony Carnacchi's Sebastopol boot shop. 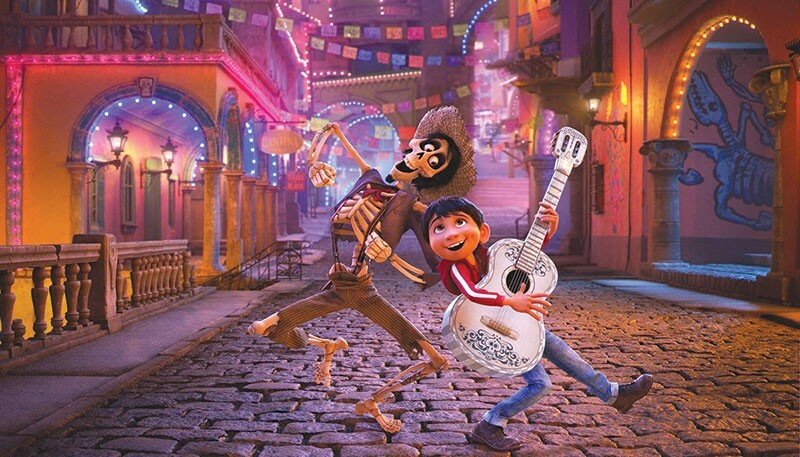 Coco opened in Sebastopol on a Tuesday, and Michael Anthony Carnacchi was there in the audience for the first area screening. The Sebastopol shoemaker-to-the-stars and city councilman isn't quite a star in the latest release from Pixar Animation Studios—but he's got a pretty cool connection to the animated feature. Carnacchi's North Main Street boot shop was used as the basis for an animated shoemaker's shop in the film, which appears several times. Carnacchi says he was contacted in 2015 via a weirdly nonspecific email that made no mention of Pixar, and then by a documentary film company, which asked if they could come shoot his shop and also made no mention of Pixar. It was all very hush-hush. The doc crew came up and shot the store, and he never heard from them again and figured they'd lost interest in him and his shop. Three weeks later, Carnacchi got a phone call from the Pixar legal people, "and they basically told me that they were interested in doing consulting with me for an upcoming production they were doing." At that point, Carnacchi connected the dots back to the mysterious email and documentary film crew. "A-ha!" he exclaims. "I figured it out!" He subsequently signed legal documents that granted Pixar exclusive rights to the film, says Carnacchi with a laugh, "in all languages and throughout the universe." Carnacchi's previous brush with high drama and power was of a different sort: he made headlines for his years-long pursuit of a federal lawsuit against U.S. Bank National, where he sued the financial institution and charged it with violating federal racketeering laws over usurious credit-card fees. Carnacchi, who was elected to the Sebastopol city council in 2016, saw Coco with his girlfriend, and they each caught parts of the shoe shop, he says, that the other missed as the film unspooled. His cobbler's shop features prominently because the main character in the film, Miguel, is descended from a shoemaking family with a musical background. Miguel wants to be a musician, and trouble ensues. He strums a magic guitar and disappears into a Day of the Dead–inspired adventure in the afterlife, along with a hairless dog named Dante. "I think they maximized the footage that they took," he says, "but I need to watch the movie again to see exactly what they took. There are some exaggerations, and certainly there are parts where I was like, 'That's my shelf with the lathe on it, that's cool!'" Equally cool was watching the credits roll. Carnacchi didn't make the "Special Thanks" cut, but he did make the "Additional Thanks" roster. "I just let out a whoop when I saw it," says Carnacchi, who shall forevermore be known in these parts as Coco Carnacchi, your spirit guide to a solid pair of swanky, hand-hewn shoes.